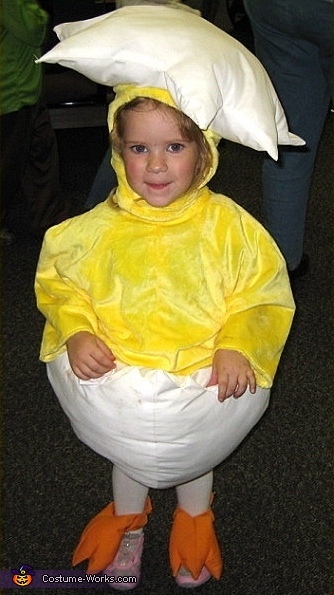 Here is 3 yr. old Aiden as a newly-hatched Chick. Another great Homemade Costume idea that could double for EASTER also! I don't mean to wag my own tail-feathers HOWEVER! Mom tells me that my Easter Egg costume pattern was used (and then of course modified) to get the basics of the project going. Enough BRAGGING though, Ü. Aiden is an adorable lil Chicky. AND Thanks for sending in the "modifications" instructions. After the contest I will have them posted on my "Homemade Costumes" Page.